Mom always say "animals connect people!" Check out this amazing story of how people are coming together to bring a dog named Jake back home to Canada. Jake’s unusual story has a community of people in Canada & the USA collaborating to bring this rescue dog home & give him the best second chance possible. Thank you for your caring, sharing and support. Let’s bring this dog home! 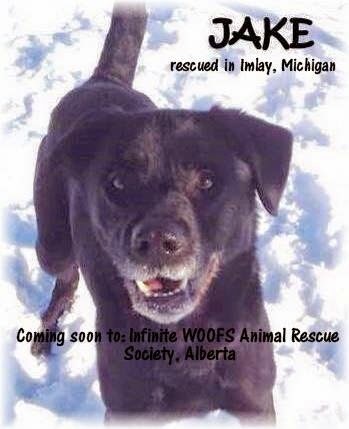 Jake is a Lab cross with an out of service # Drayton Valley, Alberta tag who ended up lost and in an Imlay, Michigan Shelter. Lisa contacted the Shelter to explore how to help Jake in the event that his family was not located. The Shelter was very open to working together to bring Jake home to Alberta & the initiative formally launched. Jake has a Charity ATB Financial bank account, Facebook page, & a twitter account. Things are moving up in the world for this boy! Hundreds of people shared Jake’s posts in efforts to reunite him with his family. We did not find them. Any inquiries about Jake came from Canadians as a result of this collaborative initiative. No one locally called or came in to look for Jake. The USA Shelter did their due diligence with the legal hold period to find the family. Jake has been pulled by the Imlay rescue and they are working with us to bring Jake home. Lisa found a fabulous Alberta foster home for Jake and a wonderful no kill, foster home based, Edmonton rescue for Jake to help oversee the process of finding Jake his new forever home. www.InfiniteWOOFS.org. Lisa is excited about helping Jake to find his new family. Jake is a happy and affectionate dog who loves to run and play with his tennis ball. We are so excited to bring this boy home to have an amazing second chance!! We have an approved ATB Financial Community Spirit Account set up for Jake. 100% of all donations go directly to covering our expenses to bring him home. Income Tax receipts are available for donations over $20.00. 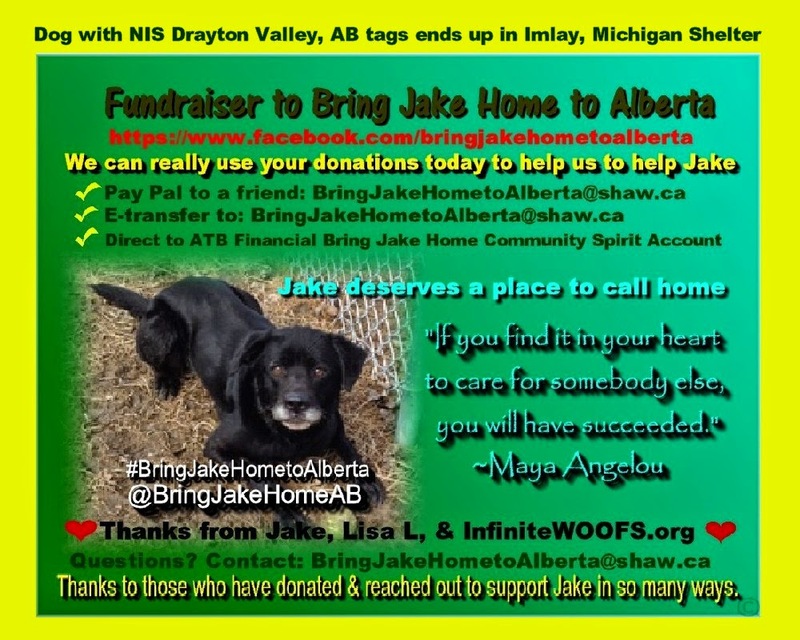 There are three ways to donate: 1) Pay Pal to a friend – search for BringJakeHometoAlberta@shaw.ca. Select immediate transfer. 2) E-transfer to BringJakeHometoAlberta@shaw.ca 3) Go to any ATB Financial and deposit directly to “Bring Jake Home” Community Spirit Account in Edmonton. Please include your name, email address, & mailing address so that we can get a tax receipt to you. We are raising funds to cover the expenses related to bringing Jake home: pull fee from the shelter, vet exam, vaccinations & health certificate, travel crate & supplies, travel & plane fare, & further vet care upon arrival to Edmonton. Many of the expenses are in US dollars. Jake is now vet approved to travel and up to date on his vaccinations. We are working on finalizing some of the legal documents and travel arrangements. Let's Rally together to bring this pawsome dog back home!! Mom and I donated to this cause because we want to help this awesome dog get back to Alberta. Hope you will too! For people who love travelling, please check out canadiantraveller.com for awesome destinations, travel tips, bucket-list adventures and so much more. Canadian Traveller is one of our amazing partners on our recent PAWs Across Canada tour, and, our upcoming Million Acts of Kindness Tour. They are on a mission to help rescue dogs through a super fun March campaign.... Rescue Madness! There are great prizes and by being part of Rescue Madness, you help animal shelters/rescues and the adorable pups waiting for their FURever families. You might be asking.... What or Who is DoggyBNB? For people who love travelling, please check out canadiantraveller.com for awesome destinations, travel tips, bucket-list adventures and so much more. 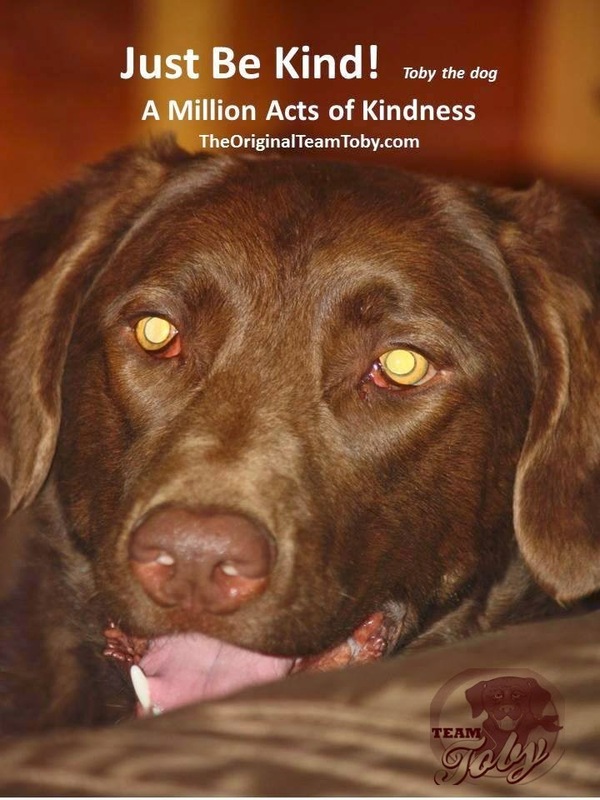 Canadian Traveller is one of our amazing partners on our PAWS Across Canada and upcoming Million Acts of Kindness tours.